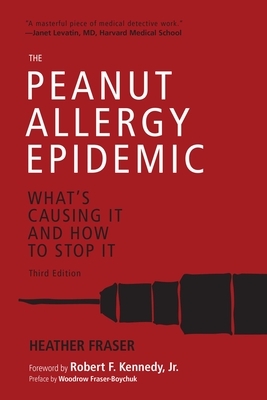 Essential reading for every parent of a child with peanut allergiesthird edition with a foreword by Robert F. Kennedy, Jr.
Why is the peanut allergy an epidemic that only seems to be found in western cultures? More than four million people in the United States alone are affected by peanut allergies, while there are few reported cases in India, a country where peanut is the primary ingredient in many baby food products. Where did this allergy come from, and does medicine play any kind of role in the phenomenon? After her own child had an anaphylactic reaction to peanut butter, historian Heather Fraser decided to discover the answers to these questions. In The Peanut Allergy Epidemic, Fraser delves into the history of this allergy, trying to understand why it largely develops in children and studying its relationship with social, medical, political, and economic factors. In an international overview of the subject, she compares the epidemic in the United States to sixteen other geographical locations; she finds that in addition to the United States in countries such as Canada, the United Kingdom, Australia, and Sweden, there is a one in fifty chance that a child, especially a male, will develop a peanut allergy. Fraser also highlights alternative medicines and explores issues of vaccine safety and other food allergies. This third edition features a foreword from Robert F. Kennedy, Jr. and a new chapter on promising leads for cures to peanut allergies. The Peanut Allergy Epidemic is a must read for every parent, teacher, and health professional. Robert F. Kennedy, Jr. is a New York Times bestselling author and one of the nation's leading environmental activists. His writing has been included in anthologies of America's best crime writing, best science writing, and best political writing. He is president of Waterkeeper Alliance, the world's largest clean water advocacy group; a professor of environmental litigation at Pace University Law School in White Plains, NY; and a senior attorney at the Natural Resources Defense Council. Mr. Kennedy is a former Assistant District Attorney in Manhattan. He cohosts thre weekly radio show Ring of Fire.